posted: May 12, 2016 by: Shayna Meliker Tags: "Clinic Specials" "News"
Ticks: They're tiny parasites that can cause big problems. And although science has gotten very good at helping us protect our pets from these parasites, many well-meaning, caring pet owners still fall for misconceptions about preventing these pests — not to mention dangerous, ineffective "home remedies" for removing them. Check out these seven myths we commonly hear about ticks and protect your pet's health, and your own, by learning the truth. 1. Ticks are the same as fleas. Giving your pet a monthly parasite medication to help protect against fleas and ticks (among other parasites) could give you the false impression that ticks and fleas are the same thing. But in fact, ticks can't jump onto pets or people like fleas can. And ticks are actually eight-legged parasites (as adults) that are more closely related to spiders and mites than they are to fleas. 2. Ticks get onto pets only by falling out of trees. This is a super-popular belief, albeit an untrue one. Ticks do not simply fall out of trees onto your pet. They can climb, and what often happens (in a behavior called questing) is that a tick will climb up a blade of grass or a shrub, and when your pet walks by and brushes against the grass or leaf, the tick reaches out and climbs onto the host (your pet). Once the tick gets onto your pet's fur, it finds a location on the skin to attach and feed. So what can you do to reduce your pet's risk of encountering ticks? Ideally, keep him out of wooded areas, tall grasses and leaf piles that make for optimal tick habitats. And if your pet does go into these types of areas, make sure you check her carefully for any ticks as soon as you can. 3. A tick can still transmit disease if the head breaks off in the skin. We can't even express how many times we've heard this one! Although you ideally want to remove the entire parasite (who wants to think about a tick's mouthparts remaining in your pet's skin? ), if you don't happen to get the whole tick out, that's OK. Once the body has been removed, the tick can no longer transmit disease. If the head does remain in your pet's skin, it may cause temporary, minor inflammation. The head should eventually fall out on its own; you can use a warm compress on the area to help speed up the process. 4. Home remedies from the Internet are more effective than using tweezers. We've heard them all: burning ticks off with a match, freezing them with a gel or drowning them under petroleum jelly or nail polish. Let's put these "home remedies" from Dr. Google to bed for the last time. Not only do they not work, they're dangerous for your pet. Why would you want to light a match near the skin of an animal who's covered in fur? Responsible pet owners know to use only tweezers or another tick-removal tool recommended by their veterinarians. Make sure you grasp the parasite as close to your pet's skin as possible and pull gently away from the skin. Also, please do not use your fingers to remove a tick. You may be exposed to tick-transmitted diseases if you come in contact with the tick's body fluids. If you're not sure how to properly remove a tick, ask your veterinarian to show you. 5. Cats get rid of ticks when they groom themselves. We bet you've heard this myth, too. Although there is some truth to this one, trust us: Cats usually do not remove all ticks through grooming. What if a tick has attached to a part of the skin that your cat can't reach to groom, like the face or ears? Your cat could still become infected with a tick-transmitted disease. And when a cat is heavily infested with these parasites, the ticks can drink enough blood to cause anemia or transmit a disease called cytauxzoonosis, which can result in serious illness or even death. 6. Only pets can get the diseases that ticks transmit. Uh oh! This is a big one. Protecting your dog or cat from ticks can actually protect your whole family (humans included) from the dangerous diseases these parasites can spread. 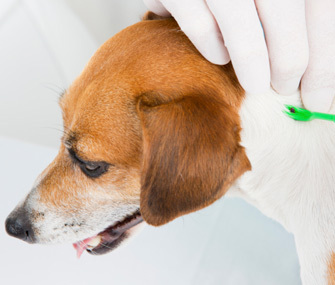 Although you won't contract Lyme disease or Rocky Mountain spotted fever from your dog, the tick that Fido brings home can just as easily bite humans and transmit those diseases directly. So don't take chances — with your pet's health or with your own. 7. My pets need protection from ticks only in the summer. You want your cat or dog to be healthy always, so why wouldn't you protect her from ticks year-round? It's a common misconception that the risk of ticks disappears with the first frost, but that's simply not true. Even if it's cold outside, your house is still heated to 69 or 70 degrees, isn't it? Plus, various species of ticks have life stages — egg, larvae, nymph and adult — that can develop throughout the whole year. OK, now that we've done our myth busting and sorted through all the things that aren't true and that you're not supposed to do, here's what you are supposed to do: Talk with your veterinarian about which tick-control product is right for your pet. Stay on schedule with applying it and consistently check your cat or dog for ticks. Your pet depends on you to keep her safe from these pesky parasites — and, really, after everything our pets do for us, it's the least we can do for them.